Monday night the Cocktail Club met at Del Rey (website is hard to read – rather dark, move your mouse around to catch highlighted links) to check out this fairly new establishment in the Belltown area. M2 and I got there about 6:00 pm, as we wanted to check out the Happy Hour (HH) food. I’ll talk more about the food in an upcoming Dine and Dish post. But today we focus on the cocktails! 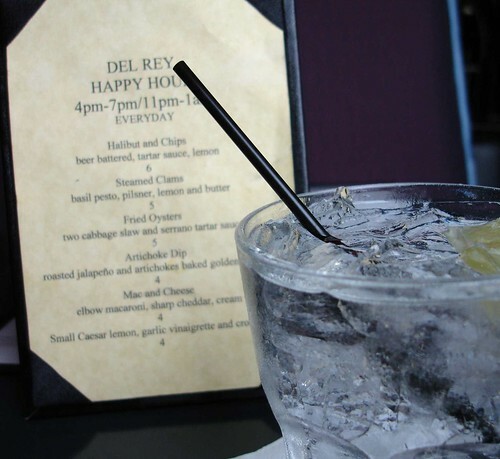 Now you may remember that I have actually visited Del Rey before. That first time I thought the place looked promising, the food looked good and the HH wine I slammed down on that first visit was decent for $4! What I didn’t mention was that after selecting Del Rey as the location for this meeting (actually I selected it as the location for last meeting but we had a little mix-up and ended up at Claudio’s and saved Del Rey for this month) that R and I had dropped in one night to sample the cocktails and we were pretty disappointed, because all of the listed specialty cocktails were like Koolaid. Uh oh. Well, they were still young so I thought the Cocktail Club meeting would really give the place a fair shake. Since we arrived during HH both M2 and I ordered G&Ts, a HH special. (Also on special Covey Run wine and Pabst Blue Ribbon. I’m not a beer person, really, and when the server told me "PBR", I had to ask what that was….) The G&Ts were fine – nothing outstanding but whatever the well gin is, is okay. About the time M2 was getting ready for her second drink KA arrived. He ordered a Tangueray Martini up and dry. M2 decided to try the Grey Goose Pomegranate Martini. We had one hit and one miss. KA said his martini was good; it had both an olive and onion as he requested. He sipped along in a happy rhythm. M2 was not so happy. Her Pomegranate Martini was too sweet. I tried it and agreed! It was almost as if they had added simple syrup in addition to the Pomegranate juice. Bummer. She managed to finish it anyway. She said her favorite one is actually at The Jitterbug, another of the Chow Foods places like the Hi-Life. About this time we were starting to wonder what had happened to the rest of our crew! R had called not feeling well and JH had to work late but where were K and JB?? Hmmm. Well, we ordered another round anyway. M2 had the Finlandia Mango Bellini, I ordered the Grey Goose L’Orange Martini and KA decided to switch to beer and ordered a Pilsner Urquel. About this time we suddenly noticed the distinctive head of JB and he’s sitting across the room! The silly guy had arrived at 7:00 but didn’t see us. He sat down and between him and our table there was another group (there were really very few people in the place). Anyway, that group blocked our line of site and so he’d been there for about an hour wondering where the heck we all were! Silly guy! He brought over an Old-Fashioned that looked beautiful but he said was made with less than stellar (my words, not his) bourbon. And he tried to leave half a cup of bad coffee at his table but his server dutifully carried it over for him. Again, the presentation was great but he didn’t like the coffee. Well, the Bellini, beer and martini arrived and this round was a little better. The Bellini smelled of mango but didn’t really taste like it, but it was still a passable Bellini. My L’Orange Martini was good, but then how can you mess up a glass of vodka? And beer is beer, so you know what you are getting, although they did serve a nice 20 oz glass of it. The finale for the day was a Bloody Mary. It was a lovely presentation and was good, but we all like spicy Bloody Marys and this did not measure up in that category. We had better luck with the food but you’ll have to wait to hear about that. So I guess I’d say if you are going for cocktails, stick with the basics, unless you like sweet (please may I have a headache?) drinks. I like the space, and the fact that there is an unobstructed view of the sound is great! Everyone who works there has been very nice! I just wish it was a little closer to the standards set by its half-sibling, Barça on Capitol Hill. Maybe it will get there – I’m not giving up yet! Oh, and P.S. that picture is BEAUTIFUL!! !